Now a days, good movies are hard to come by. I do not go to the movies nearly as much as I once did. Opening today is a movie I do recommend going to see. 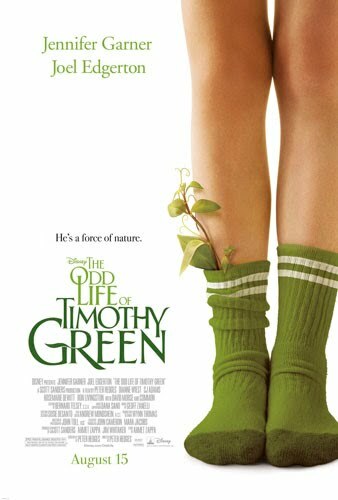 The Odd Life Of Timothy Green is a movie for everyone. When Cindy and Jim are given the worst news possible, they are unable to have children, they are emotional wrecks. Trying to comfort each other, they plan out what their child would be like. Writing all of the attributes of the baby on pieces of paper, they help to release a lot of grief. What they don't expect is a visitor in the middle of the night!! Timothy appears, and shows Cindy and Jim what being parents feels like and really means. You get to watch Cindy and Jim show true love while battling all the issues that come with raising a child. We all know it is not easy, and you can not parent out of a book!! With this movie, you will need a bottle of water to drink after laughing so hard, and a box of tissues!! The Odd Life Of Timothy Green opens today. Take the kids to see it and let me know what you think!! I especially love the boy who plays Timothy (CJ Adams.) Keep a watch on him. He may just be the next Leonardo DiCaprio!!! I totally agree that if there's one movie to see this summer, it should be this one! Such a special movie and really perfect for the whole family.